what's left, originally uploaded by jahansell. There is no finer toy than a bucket and shovel! I bet they had a wonderful day! Oh this reminds me of when the children were young. We lived in Kent then; right near the beach and so many buckets and spades were left behind by families. 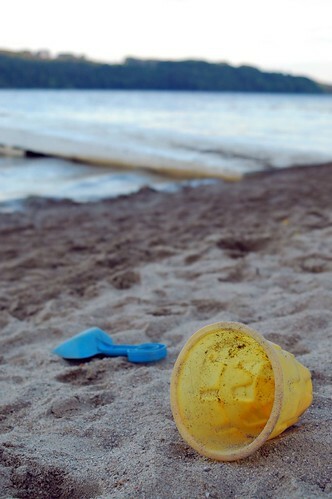 My children would collect them and then leave them on what we called "the bucketstep" (where the tide didn't reach) in case the owners returned or other children wanted to use them. Evidence remains of a day full of fun and imagination. Interesting photograph. Lots of memories there.